In all truthfulness, Metallia wasn't really a character. She (it?) was an omnipresent force in the Dark Kingdom, ruling the entire dimension through Beryl for the entire purpose of releasing itself from its imprisonment. Beryl and the Shitennou often refer to her as "The Great Leader", but when they use a name, they always use "Queen Metallia-sama", which, plus the distorted-but-clearly-female voice and the way it takes a pseudo-Beryl form at the end, is why it's referred to as female. What Metallia really is, however, is a concentration of hatred, but this concentration of hatred has the ability to make its will known. It is quite powerful, especially considering the fact that until the last episode in the season, it couldn't do anything but work with an intermediary to get what it wished done. It had no form until episode 25, then it took on the orange mass it would hold until the last episode of the season. Why does it have no form? Well, that's a bit of a story. You see, back around the time of the reign of the Silver Millennium, a disturbance was taking place on the sun. Dark, ominous sunspots had been appearing on its surface, and these were getting worse and worse. 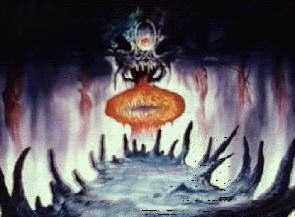 And this signified the emergence of the evil energy incarnate known as Metallia. Now, how she gained her power and her followers is unknown. However, it came to pass that eventually her forces became a full-blown army. This army, led by Metallia's avatar sorceress Beryl and the Shitennou who served under her, was mostly made up of the already-insurgent people of earth (many of whom were already jealous of the near-immortality of their guardians on the moon, and thus susceptible to manipulation) under the mind-control power of the evil being. On the day when the entire sun was covered by these sunspots, Metallia's army attacked. With the evil energy behind them, these forces were just about invulnerable, and even the Moon Kingdom's protectors, the Sailorsenshi, were helpless. It was about this point when Beryl crowed to her "dearest Metallia-sama" that the Dark Kingdom was being born. Indeed, this was true; no longer did they have to hide. 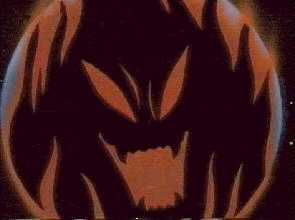 However, they did not take into account the Moon Kingdom's most powerful weapon, the Maboroshi no Ginzuishou. The Moon Kingdom's sovereign, Queen Serenity, used this at the expense of her life to seal Metallia away, to tear apart the Dark Kingdom army, and to send her daughter and her protectors to the future in case of the Dark Kingdom's return. So hey! The Dark Kingdom was begun by Metallia, and it was because of Metallia that the whole premise of Bishoujo Senshi Sailormoon existed. That makes it -- and her -- pretty important, doesn't it? Anyway, as expected, the Dark Kingdom did return. Metallia, however, had remained dormant, too tightly sealed. 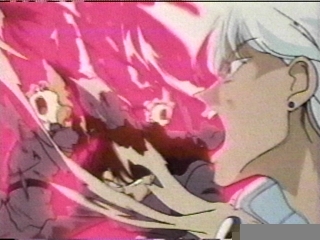 She needed power to escape from her cocoon; it was for its freedom that Jadeite and Nephrite gathered energy and Zoisite and Kunzite sought the ginzuishou. After Nephrite's death, Beryl had enough energy to awaken but not release Metallia; this is the reason for her orange blob form. Once she had awakened, she still didn't do much, merely offering orders and advice to Beryl and helping restore Endymion to health from the otherwise-fatal wound inflicted by Zoisite. Otherwise, she basically just sat there. Despite the great leader's inactivity, Beryl was reliant on Metallia for all of her power and authority, so she was very observant to her wishes. If the big orange blob said jump, she would, despite the drawbacks of doing so in the type of dress that was Beryl's attire. Toward the end of the season, things began to escalate. The sun began developing sunspots eerily similar to those when the Silver Millennium had been destroyed, and Metallia herself decreed that when the sunspots would totally take over the sun once more, and on that day, she would revive. 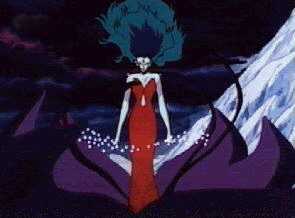 And her revival, plus the power of the ginzuishou, would enable Beryl and the Dark Kingdom to take over the earth. This revelation took place in episode forty-two. Following that, there was no mention of Metallia's revival. This is because the senshi, seeing the terrible disasters that were already coming just with that much disturbance on the sun, decided not to wait for the sunspots to take over again, but rather, to take the initiative and go against the Dark Kingdom themselves. This really didn't concern Metallia, who was too busy preparing to revive with the impending pseudo-solar-eclipse. But finally, after Beryl came begging for help after a defeat by Sailormoon and Endymion, who died after becoming de-brainwashed, Metallia finally emerged, the orange shell exploding into some pink goo and a floating cloud. This absorbed Beryl's body, granting it amazing strength, size, power, and a new look. When this happened, bad stuff started goin' down in Tokyo. (and assumably all over the rest of the world, too -- that much wasn't shown, but the rest of the world had been affected earlier, and if Japan was being affected by what was going on at the North Pole -- where this battle was taking place, y'know -- the rest of the world should have been, as well.) Winds whipped up, the sky grew dark... that sort of thing. And she was what Sailormoon fought her last battle against. As would be expected, though, despite her immense power, she too lost to the forces of good -- Princess Serenity, the spirits of the fallen Sailorsenshi, and the ginzuishou. I wasn't too sad. For me, the show wasn't worth it without the Shitennou. I think leaving the end there would have been nice, but Sailormoon went on, without the Dark Kingdom. Plus, the end of Metallia wasn't that much of a blow, even to a Dark Kingdom fan. Like I said in the very first line of this shrine, she wasn't much of a character. She was evil energy. She was a thing that occasionally spoke. She had no development whatsoever. Some youma had more personality than she did. So, on a personal note, I bet you're wondering (well, I would, if I were you! ), "Why, if Gita doesn't much care for Metallia, did she name her site In Metallia's Name?" Evil doesn't always take the form of prettyboys.